Everyone once in a while, my carrier will send these flash messages to my iPhone. When the message is received, there no alert sound nor any vibration. The screen stays on until I tap on Cancel or Accept. If my phone is in my pocket, I have no way of knowing if I have received these messages and it can be quite easy to accidentally tap on Accept while taking out the phone from my pocket. 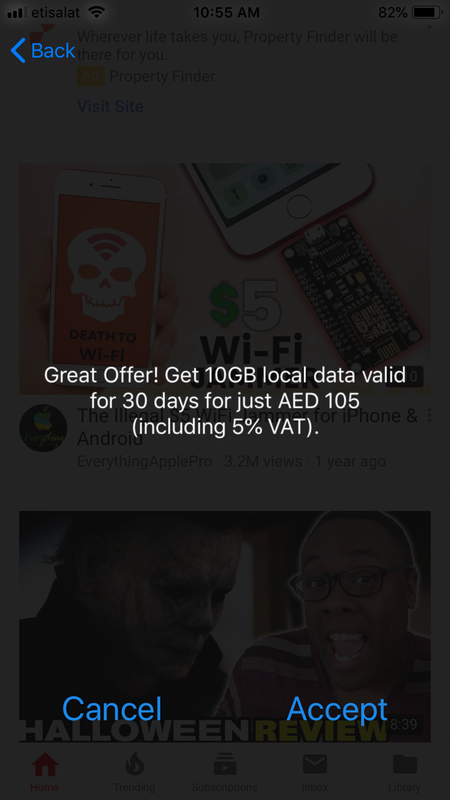 If I tap on Accept, it will immediately deduct the amount for the advertised "deal" in the message. I think their main idea behind this is to get people to accidentally tap on Accept unknowingly. How do I stop this cheap scam-like tactic? I've never seen anything like that. I do get offers, but they come via text msg only. Is there no way to opt out? Typically, you cannot unless you root your phone or switch carriers. Have you tried calling your carrier? That, or if you may have a box under your account settings that you have checked that tells them it is okay for them to send you special offers etc. Never heard of this before. Who's your carrier? Is this a cheap plan that is subsidized by in-your-face ads? If so you might not be able to disable them. As said above, call your carrier. Didnt even know iPhones could get a push message like that Carrier looks sleazy as hell. I had a quick google and it seems the US doesnt allow ads like this. A solution that may work is dialing *121*46#. It turns those ads off for certain countries. Yes, this is a cheap plan. It's a pre-paid plan with no data. I just use Wi-Fi for data/Internet. The carrier is Etisalat. I'll try to contact them about it. I tried dialing *121*46# but it said "Invalid Service". Lastly, why would Apple even allow such a thing on iOS? I think you answered your own question with "Yes, this is a cheap plan"
Apple is not controlling you to put the phone on the cheap plan. Would you rather they block your cheap plan? Or are you hoping they would allow you the cheap plan but block the the Carrier the ad money they need to pay for the plan you have by blocking the popups? I would suggest a different, maybe not so cheap plan, with out the popups. These are the carrier's own deals that the carrier itself is forcing in my face. They don't get any ad money for these ads (unless they like paying themselves for these ads). Who says iPhones only deserve high-end plans? Also, my question was not answered. 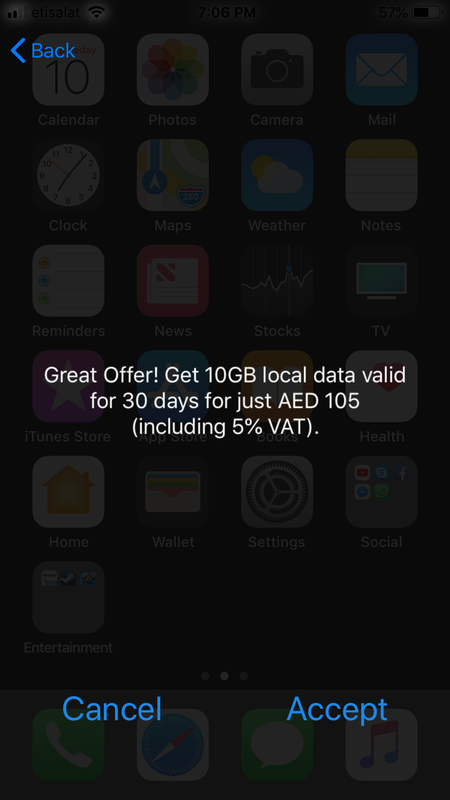 Why would Apple even allow these kind of ads/pop-ups on iOS? Unless these types of messages are meant for something else and the carrier is abusing the system. Look at it another way, why would Apple block anything that wasn't a security concern? All that would do is alienate carriers from using their devices which they aren't going to do. I don't want to start an argument but I can already think of a few things that Apple "blocks" that are not likely to be security issues/concerns. For example, iOS only supports MP4 video files and you can only transfer media onto iOS devices through iTunes. For example, iOS only supports MP4 video files and you can only transfer media onto iOS devices through iTunes. That's a user limitation, not a carrier limitation. I get this crap as well and don’t know wtf to do. If you do find a solution let me know what up. Why don't you ask this at http://xda-developers.com/ ?